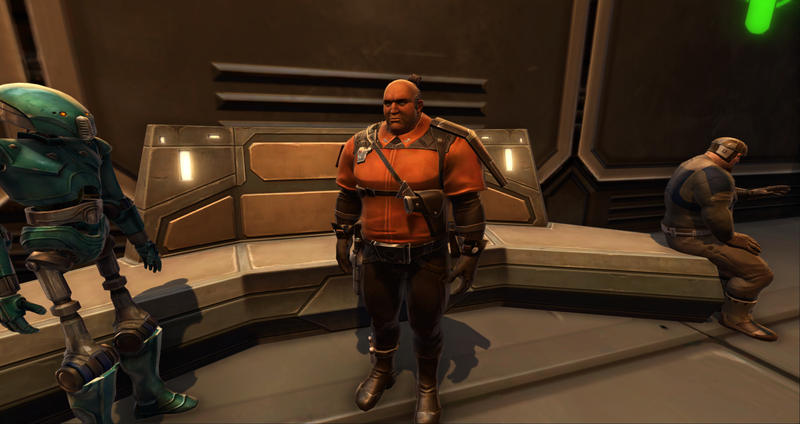 Everyone focuses on Imperial dress but nobody seems to care for the spiffy pub ones. :( So here's a quickly made list of different NPC uniform styles which hopefully will give people inspiration as to what colours to use in their own pub troopers! 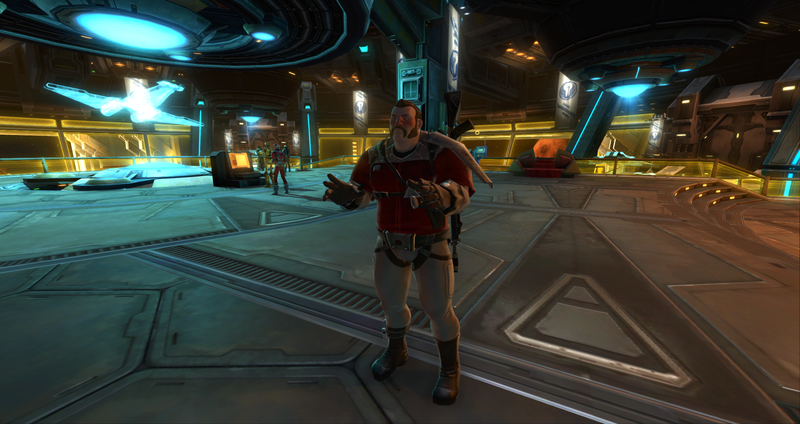 The outfit itself requires fleet commendations but it's not hard to get those from GSF. Orange with brown pants. 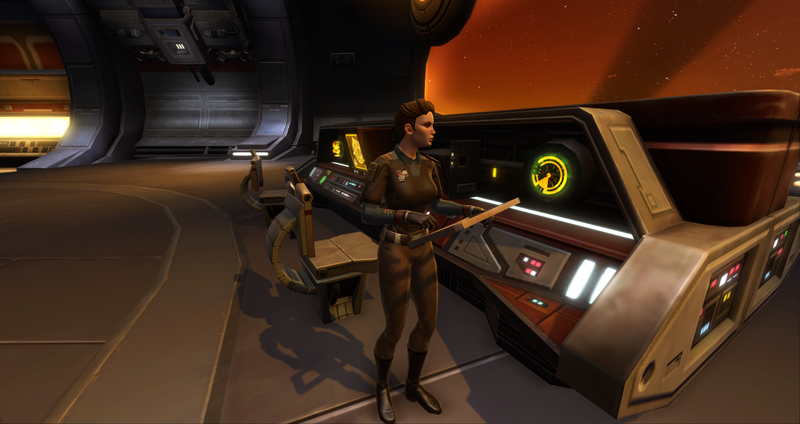 Some pilots and flight crew wear full orange uniforms instead of having brown pants, you can find those on Makeb and the fleet. Dark brown with blue sleeves and khaki pants. Red with white pants. I think this is for starfighter wing commanders since it only shows up in the GSF hangars and a lot of Republic pilots wear red, you can even see one in the background. The Republic Army uses the same few colours (blue, brown, beige, and white) but in a bunch of different combinations with seemingly no rhyme or reason. Except for this Private. Most of these don't have suitable dyes unfortunately. The standard colour, beige with various shades of brown sleeves. 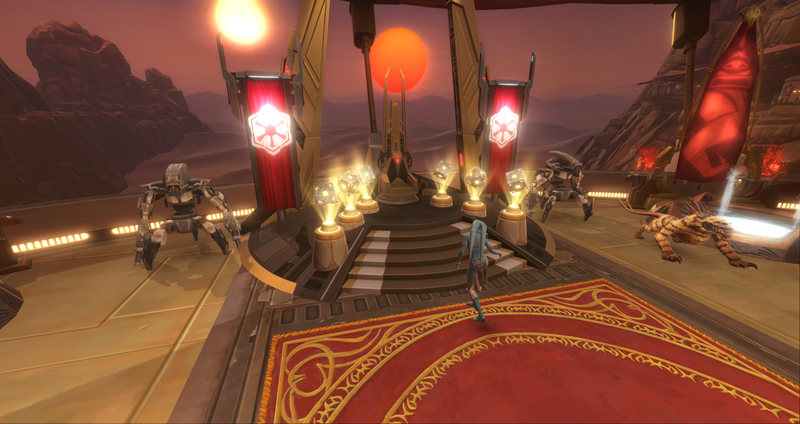 Found pretty much everywhere from Belsavis to Alderaan, this picture is from Balmorra. Beige with blue sleeves. 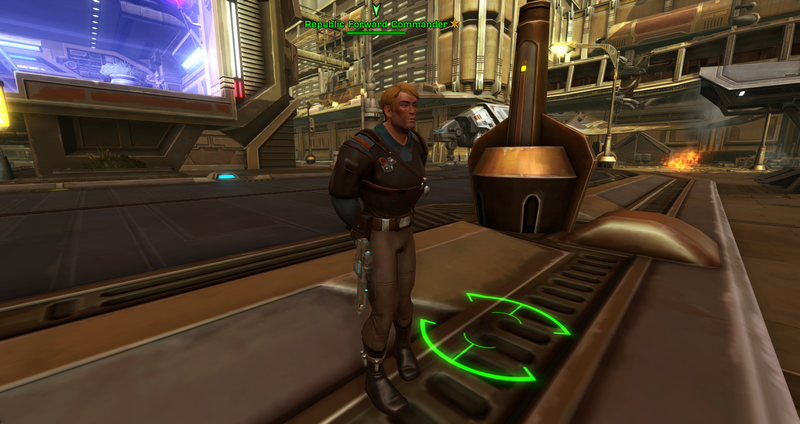 Found on Corellia. Blue with white sleeves and pants. 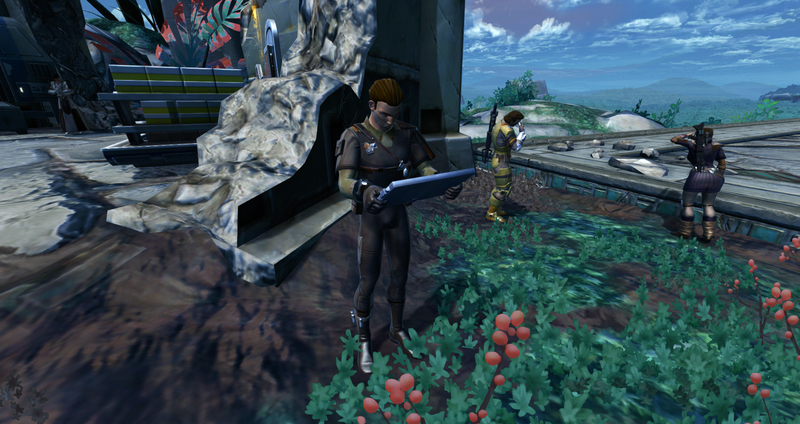 Found on Ord Mantell. Blue with white sleeves and dark blue pants. 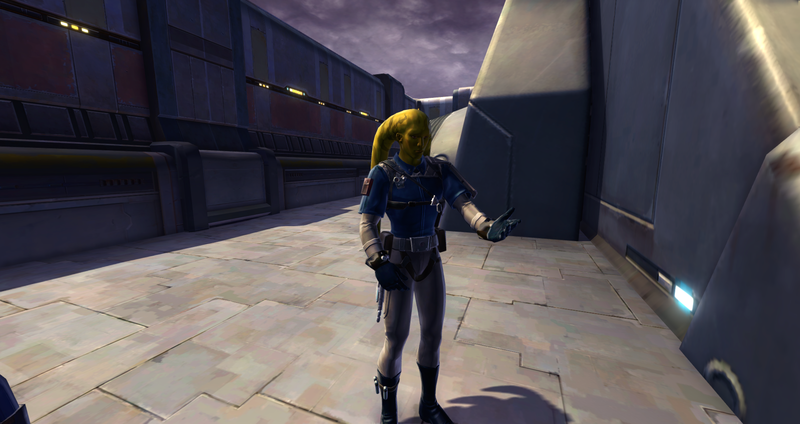 Found on Corellia and Balmorra. 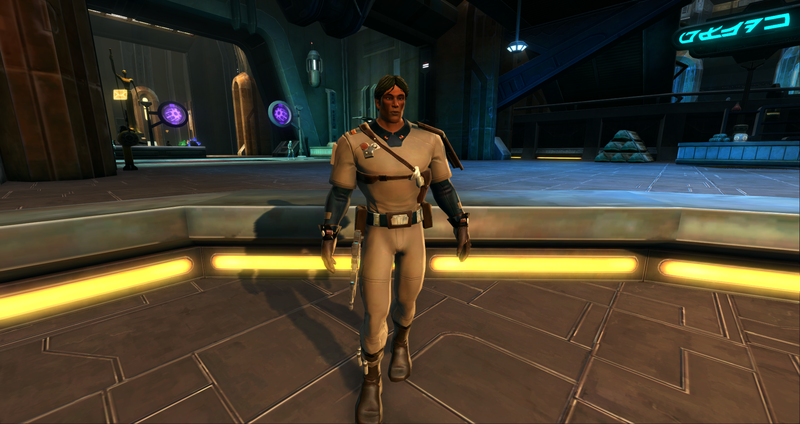 Dark brown with blue sleeves and khaki pants, found on Corellia. This is a Navy uniform, so maybe they're a marine? Dark greyish brown with varying sleeves. Found on Ilum with rust-coloured sleeves and Yavin IV with pale green sleeves. Prison guards/officers seem to wear orange. The guy on the top was General of Belsavis and wears orange with brown pants. On the bottom is just a generic Belsavis officer wearing beige with orange pants/sleeves, it looks horrible so don't use that one. How do the Jedi deal with mental disorders? Are there any sort of established methods for certain types? Or magic force techniques that aren't scarily close to Sith alchemy? Specifically what I want to know is how the Order helps members who have PTSD, especially from Sith-related trauma, but i'm also kinda curious as to how they'd manage things like schizophrenia or other psychotic disorders. Or if they'd even recruit people who have preexisting conditions in the first place. I feel like there's probably no established lore on this topic, so any headcanons or RP people have done involving that sort of thing would be helpful. My bored daydreaming has led me to thinking about how my characters and their IC allies/followers would fit as NPCs in SWTOR. I mostly think of operation or flashpoint encounters, like what their attacks would be and all that, but sometimes also what their dialogue would be if they were story or side quest givers in new planets/areas. 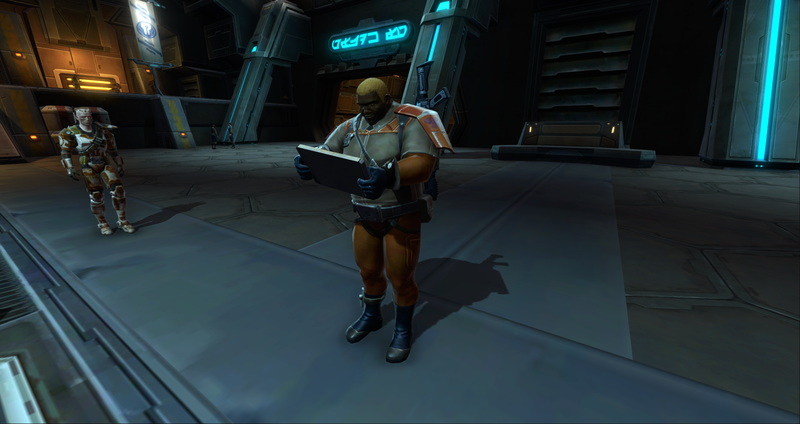 It's an interesting way to think of how they would fit into the SWTOR world. edit: also companions! I tend to think of who my characters could be companions to, whether it's to an existing class or another character. I have a fleshed out raid idea involving my main's power base that I can post here eventually once I have it formatted. It's probably to be followed by a second raid too à la Dread Fortress and Dread Palace, but it's a lot of work to think up all the mechanics lol. 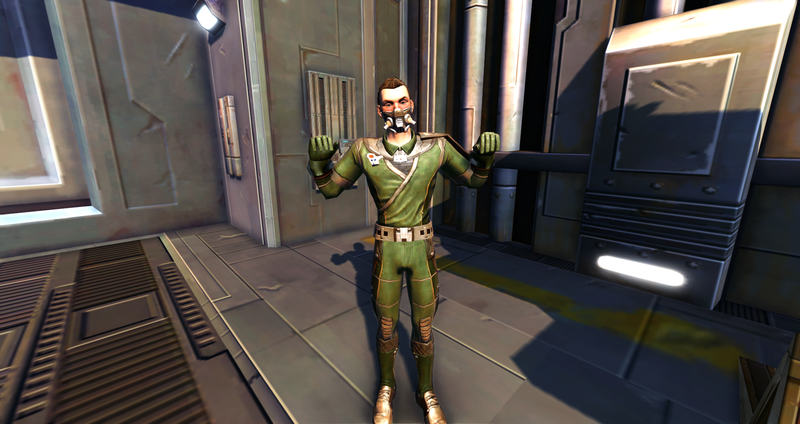 I thought it would be nice to have a fashion thread for strongholds, and I couldn't find any old ones that I swear existed at some point, so here is one. What are your favourite decorating arrangements that you've done? Like groups of decorations that work really well together, individual decorations used in a unique way, or just sections or rooms in strongholds that look nice! Also a quick tip that might help for screenshots: Your FOV is increased while mounted, so if you're on a speeder you can capture more stuff in one picture. Even while zoomed in all the way. Here are a few minor things to start off with. An Eternal Throne with force focuses on it. Also flags! A desk! With a computer! My favourite, literally just four couches around a square decoration. 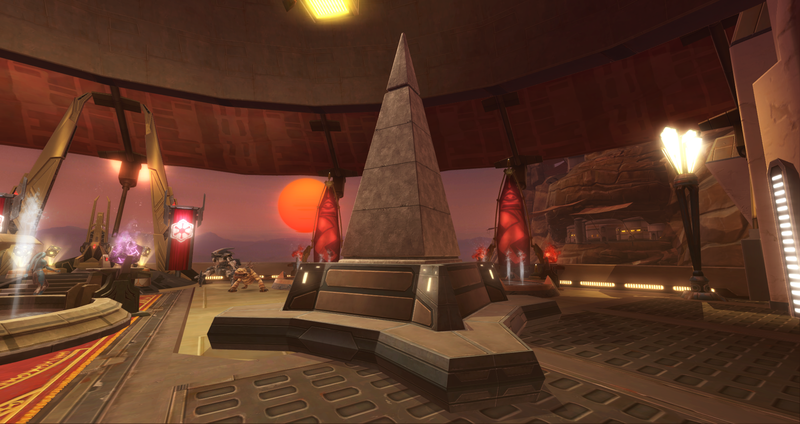 It works with most any square decoration, I like to use Yavin Obelisks and Rakata Energy Pylons tho because there's no square planters big enough. Roleplay Workshop / Pub military RP? I know we have a lot of Jedi here, but I haven't heard about any other stuff pub-side in a long time. So are there any people or active guilds doing pub military RP right now? Like with troopers and open combat. Covert stuff is fun too but the thread for SIS things already went nowhere. I should probably note that i'm specifically talking about the usual pub vs imp things. None of that alliance crap, lol. Roleplay Workshop / Stealth weapons? What are the best options for stealthy ranged weapons in the current era? I know stealth blasters don't exist yet, and slugthrowers can be made silent, but that's about the extent of my knowledge on stealth weapons in Star Wars. I'm not sure how useful a suppressed slugthrower would be against any sort of armour without completely removing its stealthiness, so is there a better choice? I have a lot of things which i'm probably not going to use, and I can't use the GTN because of credit limits, so i'm going to sell them here! Prices are very negotiable, i'm just listing the GTN prices here for reference because idk what else to put. Some of them are just ridiculous so feel free to completely ignore them and suggest your own price, lol. Also I added TOR fashion links to everything. 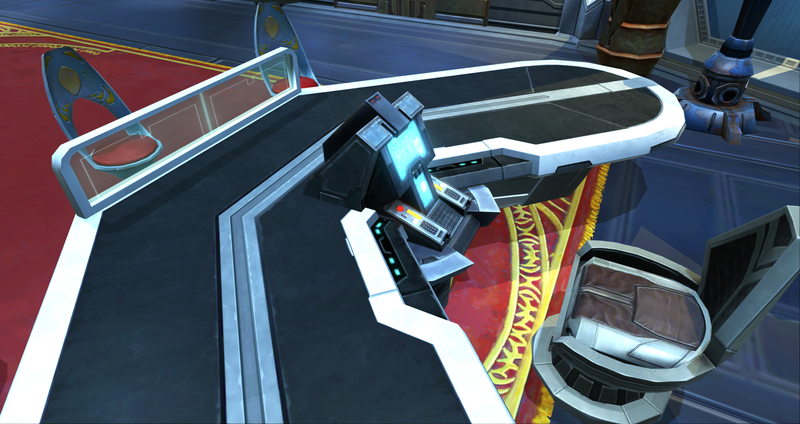 Sith Raider Belt - Not even on the GTN. Sith Raider Armguards - Also not on the GTN. Also if anyone wants to trade some of these items for the Calculated Mercenary set, that is an option! Am willing to pay millions of credits for the full set. I have 17.4 million in my legacy bank that I can use immediately, if that's not enough I can also get a whole lot more from my guild bank but that could take several days. I think in the past i've usually paid around 2-3 million for full direct buy sets if that matters. edit: changed title because i'm buying too much lol. also I have obtained the set now! gonna keep using this thread tho, because why not? It looks like a freaking axe and that's awesome. Looking for the short one tho, not the full-size one. Willing to trade items or credits for it. Not sure what the price is going to be on the GTN, but it's gold and it's a melee weapon so that's slightly worrying. 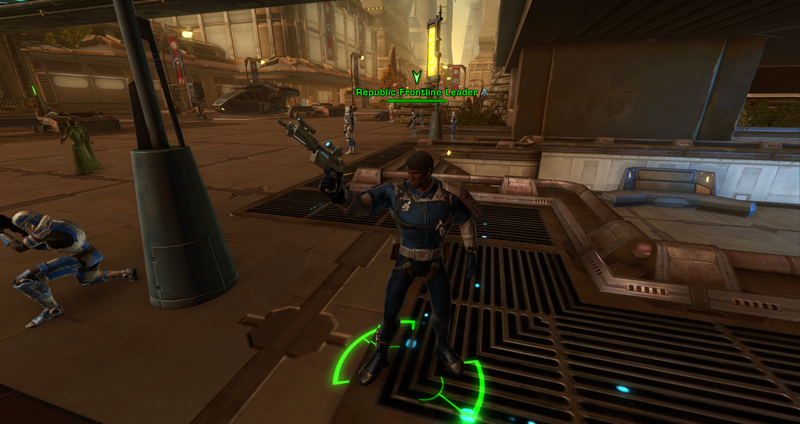 I have a Max-Tac precision rifle and Satele Shan's dualsaber for trade, but I can pay in credits or hugs or whatever too. Edit: Just to clarify things I am willing to pay millions of credits to get this set. That second sentence was a joke. I am usually not a drawing person. But trying to make an RPG campaign setting inspired me to at least try some sketching, and it didn't go 100% terribly! They're still fairly crap but I am actually satisfied, or at least I don't feel like scrapping everything which is basically close enough. I might branch out into GW2 and SWTOR portraits, mostly the latter because I always wanted to draw Sith and Imperials. For now it's just generic space fantasy stuff tho. edit: I updated some of these a while back with better shading or whatever so i'll put the new ones next to the old ones. 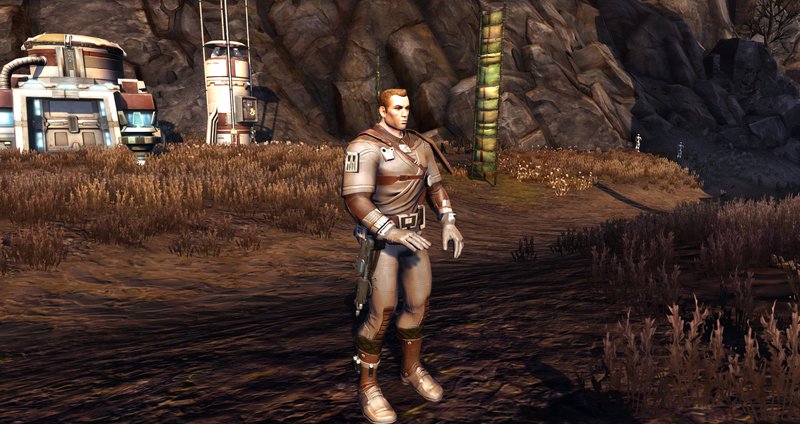 The primary military force of the Immortal Dominion of Sol is the Mantle, a highly trained professional army with strict physical standards and high-tech gear. They are split into the Order of the Navy and the Order of the Army, both having a rigid hierarchy and being subordinate to the Dominion's central church. The standard attire of an army sub-officer is a suit of Auspice Armour, made of curved adamantine plates and an arasilk suit to provide effective protection against shrapnel or light particle beam fire. As sub-officers do not have a dress uniform, their armour tends to fill the same role as formal attire instead of being purely functional. Librarians are servants of the Dominion's two goddesses, chosen from extremely powerful mages and enhanced by divine magic to become nearly immortal beings of incredible power. They are rare, however, and tend to live in secluded monasteries where they study without interference from the outside world. Roleplay Workshop / Pub-side spy roleplay? Has there ever been any sort of SIS-themed RP on this server? I know that there used to be a ton of edgy imperial intelligence agents but i've never seen anything with their Republic counterparts. If not, would people be interested in trying to organize some? Also, what about law enforcement stuff like the Coruscant Security Force? That could easily tie in to counter-espionage and such, plus it sounds fun. I'd like to trade some items (no credits because preferred status) for multiple Uniform Deep Blue dyes. 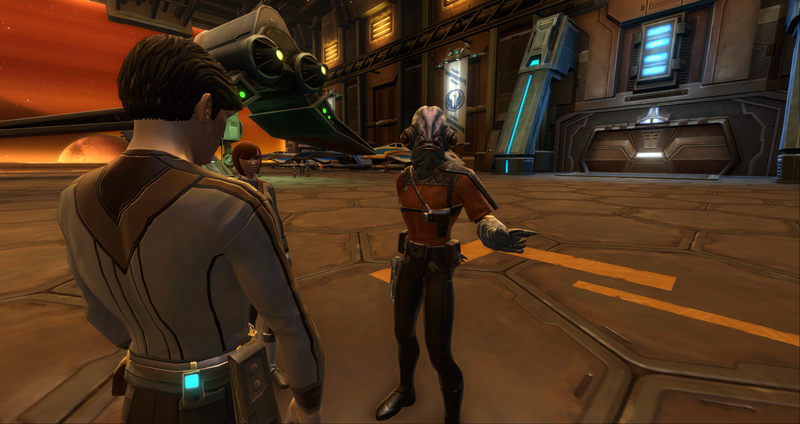 I can buy stuff from the cartel market or whatever, I also have some other things that are less valuable like old dyes and a few pieces of armour.